The Safe Zone is a custom circular perimeter set around your home which triggers an escape alert if your pet leaves the area. When the Safe Zone is turned ON the Pod will auto-refresh your pet’s location every 5 minutes by default, however, the refresh rate can be adjusted between 2 mins and 2 hours. When your pet’s location is detected outside of the Safe Zone, you’ll receive a notification on your phone or tablet. You can access the Safe Zone via the Zone Alerts button on the Pet Screen. Please note the Pod is not pin-point accurate and false alerts may be triggered if your Safe Zone is too small. We recommend making your Safe Zone radius at least 30ft (10m) larger than the “safe” area. This will allow a small buffer to minimize false alerts but will not significantly affect your escape alerts. Click into the Zone Alerts from the Pet screen. Here you will see the option to “edit or create zone” – click this button. Now you’ll see a screen where you can “create zone” – click this. Enter your address and the app will move the circle directly over the address you entered. You can move and resize the circle to your liking (see below). You can name your zone by going to the options button in the right corner (three dots) and selecting “rename.” Enter the name of the zone (eg. Home or Kennel). Once you’re satisfied, click “save.” You can edit the zones in the very same way. Please note the Pod is not pin-point accurate and false alerts may be triggered if your Safe Zone is too small. We recommend making your Safe Zone radius at least 30ft (10m) larger than the “safe” area. This will allow a small buffer to minimize false alerts but will not significantly affect your escape alerts. Add as many zones as you’d like. Once you have all of your desired zones, you can go back to the zones screen and tick off the zones you’d like to be active for your pet. This means, you don’t have to move zones when you need to keep an eye on your pet somewhere new. Simply turn off your “home” zone and select your “kennel” zone (or whatever you choose to name them). Please note, when you turn your zones on, this will turn on every zone you have selected! 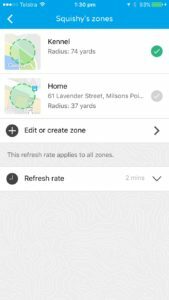 Once your Safe Zone is setup you can move, resize, rename or delete it from the list of zones. 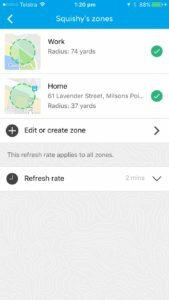 Resizing the Safe Zone - you can use two fingers on your device to adjust the size of your Safe Zone. The Safe Zone area will turn red if you try to make it too large or too small. We recommend a radius of at leas 35 yards. Click on the Options Button in the top right corner of the Safe Zone screen. A menu will appear with the option to Delete the Safe Zone. On the main zones page, you’ll see a drop-down which will allow you to customize the refresh rate. 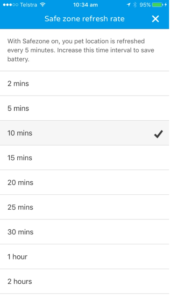 You can select from 2 minutes all the way up to 2 hours depending on your needs. The Refresh Rate will tell the Pod how often it should auto-refresh your pet’s location to check to see if he or she has escaped. The more often the auto-refresh, the faster the battery will drain. For best battery life we recommend a minimum of a 10-minute refresh rate. Pod allows you to receive an alert on your phone or computer when your pet leaves your set zone. When your Safe Zone(s) is/are enabled (turned ON), the Pod will start to auto-refresh your pet’s location every 5 minutes (default). You can customize the time interval for which you’d like the Pod to auto-refresh. It’s important to note that the less time in between locates, the higher the impact will be on the battery life. 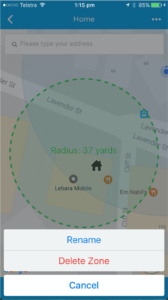 If the Pod’s location is outside of the perimeter for any of the locates, it will trigger an alert on your phone or tablet. This means alerts will only be sent at the time intervals you’ve selected. The perimeter alerts are sent as push notifications and not text messages. You must have push notifications enabled on your device to receive them – we recommend setting them to ‘Alerts’ and not ‘Banners,’ as the banner notifications will disappear. GPS technology and Wi-Fi are not covered in all areas and have a location accuracy of up to +/- 10 meters (30 ft). There are other factors that will influence the reliability of the escape alerts and you will risk false alerts if the Safe Zone is too small. Make sure Safe Zone is large enough so that you will not get false alerts. We recommend 10 meters away from the closest point of the desired perimeter. If your home Wi-Fi network is quite strong and goes past your Safe Zone, this could cause a slight delay in escape alerts. Battery life will vary when Safe Zone is on. At a 5 minute Safe Zone Refresh Rate you can expect to get 1 – 2 days of battery life. Battery life will increase as Refresh Rate gets further apart.